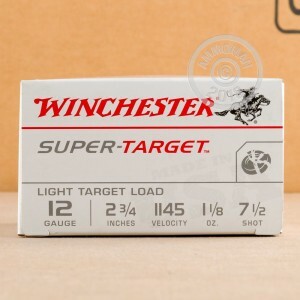 If you're looking for an accurate, light-recoiling target load for sporting clays or trap shooting, Winchester Super Target ammo has you covered. 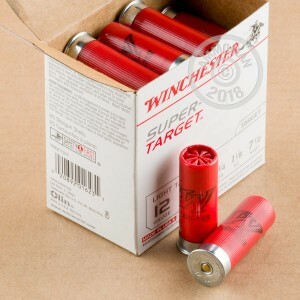 These 2-3/4" shells come in boxes of 25 and fire a 1-1/8 oz. payload of #7.5 shot at a muzzle velocity of 1,145 feet per second. 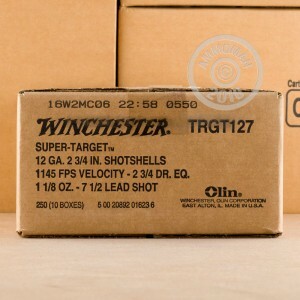 This ammo is loaded in Oxford, Mississippi using hinged wads that improve patterning and help keep recoil under control for reduced fatigue during longer shooting sessions. Place an order for $99 or more and AmmoMan.com will cover the cost of shipping!